Trees are good for you. Walking in the woods can reduce stress and depression, ease muscle tension, counter attention deficit disorder, and even calm an erratic heart. You knew that anyway, but fortunately intrepid Finnish researchers have come up with interesting proof. Published in Environmental Health Magazine, the Finns have collated evidence that forests promote Human Health. Forests reduce physical and mental stress. The researchers say, " Forests represent rich natural pharmacies by virtue of being enormous sources of plant and microbial material with known or potential medicinal or nutritional value. Forest food offers a safety net for the most vulnerable population groups in developing countries, and healthy forest ecosystems may also help in regulation of infectious diseases." Despite the large amount of work on biodiversity and forests, the psychological and medicinal aspects have not been studied greatly. Perhaps their very familiarity made them elusive as a subject of study - we all know from childhood on that it is good to have a romp in the woods. Mild exercise of this kind is a life-prolonging activity, and may aid in the reduction of obesity. One project taking advantage of this is the British Green Gym programme which helps people to become physically active by offering opportunities to exercise in the open air through local environmental or gardening work. Forests may even have an anti-cancer factor, "Forest visits may strengthen the human immune system. 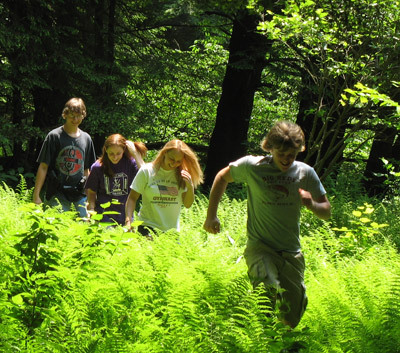 Spending time in forest increases natural killer (NK) activity in humans. The increase was observed as long as 30 days later. Since NK cells can kill tumor cells by releasing anticancer proteins, forest visits may have a preventive effect on cancer generation and development," according to Japanese researchers. Wood notable for 12,000 pollarded hornbeams, a pond, small area of heathland, and its age. A sign of this are plants such as the butcher's broom, a member of the lily family that actually looks more like dwarf holly, and whose spiky leaves were used to scrub butcher's blocks. On the heath is lousewort, a small, pink-flowered semi-parasite on grass. Some 940 species of insect have been recorded here, among them the goat moth, whose larvae live inside trees for up to five years before emerging. The wood is a remnant of royal hunting forest, and the trust has recently bought and added 53 adjoining acres. 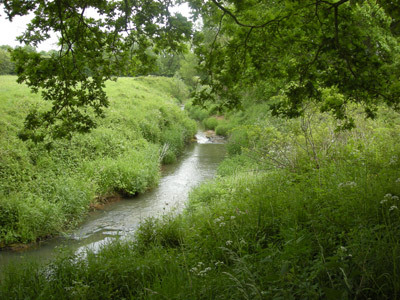 A national nature reserve which has three major habitats: high forest, coppice with glades and rides, and heath. On the latter are the nightjar, the gaping-mouthed bird whose churring sounds like a distant moped. Other birds here are the hawfinch, all three species of woodpecker, nightingale, and, in some summers, the golden oriole. The 30 species of butterfly include the heath fritillary, which was on the verge of extinction 40 years ago. Habitat management, especially coppicing trees such as happens here, means it is now recovering in Kent and Essex where, despite its name, it prefers woods. A real local landmark, standing proud on a rise from an otherwise flat landscape. Oak and hazel woods have stood here, and been managed, for centuries, and in the 1950s around half of it was planted with a broadleaf-conifer mix. The trust has been weeding out the conifers and restoring the wood to its original character. An avenue of ornamental Corsican pines runs through the site, and tawny owls are resident here. This is our native "hooting" owl. It is smaller than most people think, being about the same size as a wood pigeon, and very loyal to old territories. An ancient wood of ash, oak, sweet chestnut, and sycamore, a 16th-century import into Britain which is so settled here it self-seeds relentlessly on any wasteland or railway embankment. Sweet chestnut was brought here by the Romans and some of the trees here are typically stout, for this species can often have girths of 25ft (7.6m) or more. This is one of the places in mainland England where the red squirrel hangs on. There are about 140,000 in the UK, as opposed to 2.5 million of the alien, more free-breeding, disease-resistant grey variety. Steeply sloping wood above Taunton Vale, with grassland at the southern end of the site. Much is done to encourage butterflies here, especially the Duke of Burgundy, a species notable for the fact that the female has two more functioning legs than the male, which has only four. 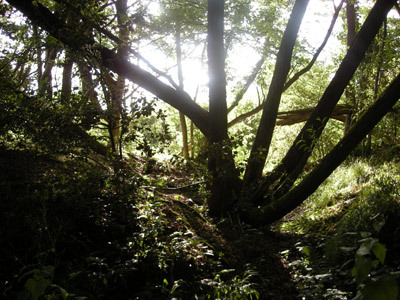 There are rare trees here, including the small-leaved lime, and a huge wild service tree – both signs of ancient woods. The service has a fruit which, once frost-bitten, is edible. Richard Mabey says in Flora Britannica that its taste has "hints of apricot, sultana, over-ripe damson, and tamarind". Beech, pine, ash and larch woods, plus limestone grassland with good views over Abergele and the coastal plain. There is flower-rich grassland, with such plants as mouse-eared hawkweed, the late winter flowering stinking hellebore, harebell, and common rock-rose, familiar to any gardener as the helianthemum. Old lead mining has left its mark with a deep, narrow gorge, and there are natural caves which are an important hibernating and roosting place for a significant population of lesser horseshoe bats. They can often be seen foraging up and down the wood's wide rides. A 23,000 acreprivate estate in the Scottish Highlands which is being returned to its pristine, pre-settlement state as an example of best practice in wilderness conservation. 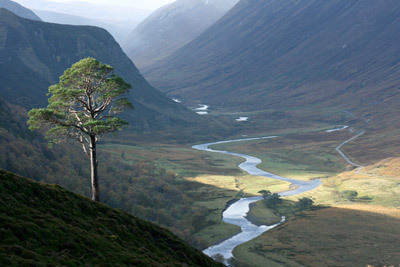 The ancient Skiach Wood at the head of Glen Alladale is one of the northernmost remnants of the ancient Caledonian forest of which just 1% remains from Roman times. Alladale is currently home to an extensive array of species including: Red deer, Roe deer, European elk (moose), Wild boar, Highland cattle, Pine Marten, Badger, Red Fox, Mountain Hare, Otter, Golden Eagle, Osprey, Peregrine Falcon, Merlin (the UK’s smallest bird of prey), Ptarmigan, Black grouse and Red-throated Diver. Native trees being planted, which includes the Carbon Manager's Trees4Business programme, are Caledonian Pine, Rowan, Willow, Birch and of course Oak. This is one of the most ambitious programmes of tree-planting in the UK. Hundreds of thousands have been planted in the past few years and another half-million are scheduled to follow.